These cookies have a moderate anise flavor, which is complemented by the icing. If you're serving them plain, or if you really love anise, you can increase the amount of anise extract to 2 teaspoons. Preheat oven to 350 degrees. Roll dough out on a lightly floured counter to 1/4 inch thickness and cut with your favorite Ann Clark Ltd. cookie cutters, then transfer cookies onto cookie sheets that have been lined with parchment paper or silicone liners. Bake 8 to 10 minutes, until lightly colored. Let cookies cool slightly on cookie sheets, then transfer to a wire rack to cool completely. Decorate with anise icing, below, or eat just plain. Whisk together 2 cups confectioners' sugar, 3 tablespoons milk, 1/4 teaspoon anise extract and a pinch salt until smooth. The mixture should be just pourable, but very thick. Add up to 1 tablespoon more milk if needed, and a few drops more anise extract to taste, if desired. Use a spoon to drizzle the icing onto the cookies and spread with a small spatula or butter knife. Leave a border around the edges of the cookies; the icing will spread. 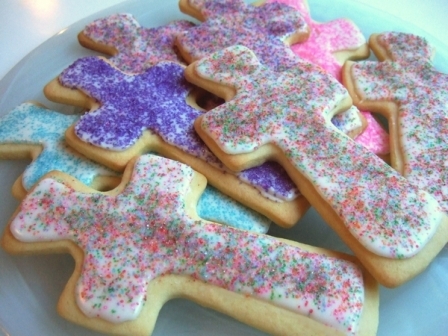 Sprinkle with colored sugar or nonpareils if desired.